The content of this page is based on Prison Architect Version 2. Sandbox mode lets the player construct a prison of your own will, with no story elements attached. This mode is accessed by loading up the game, by selling another prison or by going into the menu and selecting the option "Create New Prison." If the latter way is selected, options can be set that will affect the gameplay. 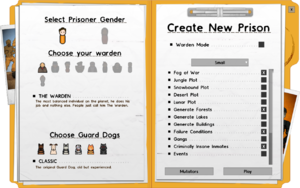 It is recommended to play through the campaigns before starting a prison in sandbox mode, as the campaigns will guide you through various elements of the gameplay. Fog of War: If fog of war is selected (indicated by an X in the box) then indoor areas of the prison will be hidden from the player unless revealed by a guard or security camera. Note that until the first prisoner arrives fog of war will not go into effect. Generate X (Forests, Lakes, Buildings): These three options control the way in which the landscape is generated. If the "Generate Forests" option is selected, then clusters of trees will be generated in addition to the individual trees that are placed on the map. Trees must be chopped down by workmen before buildings can be built, but the felled trees can be sold. If the "Generate Lakes" option is select then parts of the map will be covered in water. Construction cannot take place on water, hence this option can be used to increase the difficulty a bit. Finally, if the "Generate Buildings" option is selected then derelict buildings will be placed on the map. These generally consist of a few walls and some concrete pads which can be incorporated into new buildings (or bulldozed). Failure Conditions: If this option is selected it will become possible for the player to fail and for game to enter a failure or "game over" state. Gangs: Whether your prisons may join gangs. Note that this may significantly change the gameplay. Events: Random incidents, disasters and challenges will occur during your game, providing extra difficulty and unpredictability. Weather and Temperature: Enables some additional events and different temperatures during day/night and seasons. Unlimited Funds: Spend as much money as you like while building your prison, as opposed to the challenge of not going into debt (having negative money) - a more pure sandbox mode. Enable Tools and Cheats: Enables the developer tools in the game. See below for more explanation. The Warden: No special abilities. The Lobbyist: Halves the likelihood of receiving prisoners who are Violent, Lethal, Volatile, Deadly or Fighters. Rita: Halves likelihood of prisoners being Stoical or Fearless. Prisoners are suppressed twice as quickly. J. W. Periwinkle: Guard Dogs have a 50% chance of fully uncovering any tunnels they detect. The Pacifier: Reduces the overall temperature of your prison, making your inmates less likely to cause trouble. Saphara Acknova: Gets a small cut of the re-sale value of each piece of contraband found. It is also possible to select 'Warden Mode' to allow you to play as the warden on site. This allows you to walk all around your prison and behave like any other character. This may add a bit of extra challenge for players who like to navigate around their prisons easily and quickly. Selecting 'Permadeath' underneath will result in Game Over whenever your warden is killed. And you can select whether your prison is for male or female prisoners. There are no mixed prisons. Women behave a little different than men, and have some unique needs, which results e.g. in some additional rooms (Family Cell, Nursery). These mutators will make your life more difficult in a variety of ways. Sometimes significantly so! Some of the options mentioned above (e.g. gangs, events and weather) can be activated during the game if they had not been selected when starting it. For this, press Esc, go to the "Extras" menu and then to "Map Settings". Be aware that these options can only be enabled and not disabled once they have been activated. If events, gangs and weather are all activated, there will be no "Map Settings" menu displayed at all. When selecting the "Enable Tools and Cheats" option (which cannot be disabled anymore), you get access to the developer tools. You won't get any Steam Achievements in this mode, and you won't be able to sell your prison. The Function keys now perform debug services, e.g. open the world properties, which gives access to many world parameters, additional overlays, etc. See Controls for more information. If you are not starting the game from the menu, but by selling another prison in the Valuation Report, you will start with the sum received from that sale instead of the $30,000. If you are playing with unlimited funds, you will start with $30,000 nonetheless. You will, however, be able to spend as much as you like. Note that with your initial eight workmen (for $100 per day each) and no other expenses, your daily cashflow will be positive in the beginning due to the $2,000 federal fund that you are receiving every day. Due to the corporate taxes of 30%, you will only receive $840 of the $1,200 that you would expect. You can build any prison you want now, with no specific objectives. Especially if playing without unlimited funds, you should probably accept some grants, though. Those add some goals to achieve during the construction of your prison, and will pay well. This page was last edited on 13 April 2019, at 12:48.